3. Click on Recover Password option corresponding to your license. 5. 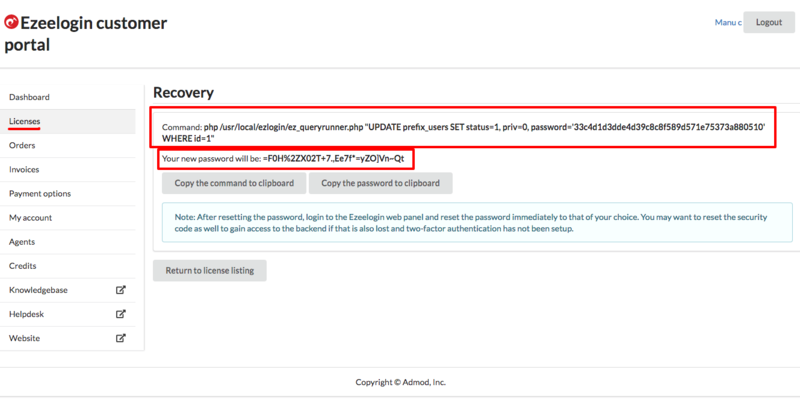 Copy & execute the command on your ezeelogin gateway server. You can also copy the new password. After resetting the password, login to the Ezeelogin web panel and reset the password immediately to that of your choice. You may want to reset the security code as well to gain access to the backend if that is also lost and two-factor authentication has not been setup. Posted - Fri, Jan 18, 2019 at 9:01 AM. This article has been viewed 112 times. Is it possible to view all ssh logs of a deleted user ? Is it possible to disable security codes in ssh gateway? How to copy files from my desktop to my ssh gateway user account so that it can be transferred to other remote servers behind the ssh gateway? What are the encryption technologies used to secure my data? What are the outbound ports that needs to be opened for fetching the license? How does the license upgrade work? What are the security measures to ensure data security?